Coming Together – Targeting Success was the title of Colegio Maya’s (American International School of Guatemala) Strategic Planning Summit. It captured well the objectives for the innovative and dynamic event to generate dialogue in bringing the learning community closer together to set future targets for school improvement. Utilising an Appreciative Inquiry (AI) approach, which aligned to the school’s culture, allowed the school’s stakeholders to engage in a meaningful and energized experience to begin creating the shared vision for school improvement. The truly magical mix included students, teachers, administrators, parents, Board Members, as well as former members of the school community. This entry was posted in Events, Stories and tagged Appreciative Inquiry, Education, Guatemala, Schools, Strategic Planning, Summit on November 18, 2010 by Sue. The world has been touched and saddened by the devastation and destruction wrought by an earthquake in Haiti. Rescue teams including religious organizations, medical and military personnel swarmed Port Au Prince in an effort to prevent further loss of life and hope. But back in Fulham, West London, a little 7 year old named Charlie Simpson cried at the images of Haitians suffering from homelessness, lack of food and death of loved ones. He was particularly touched by the children many of whom became orphans. 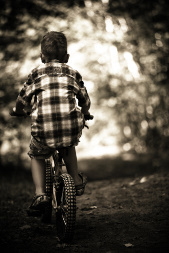 He appealed to his mother to help him set up a sponsored bike ride around a nearby park. She set up a web page on www.justgiving.com which allows donors to contribute to UNICEF. With that simple statement, his simple act of riding his bike eight kilometers (five miles) around a park and the dream of raising $500 (US), Charlie has to date raised over £100,000 ($160,000). There was an outpouring of support, encouragement and money from those who were inspired by this act of compassion on the part of one so young. The learning lesson here is one of the elegance and simplicity of the dream and the act. Charlie’s dream is huge – to be able to supply the needs of everyone in Haiti – but his action was wonderfully simple. Only a child or one that is child-hearted could combine these elements into effective action that can change the world. This entry was posted in Stories and tagged Changing the World, Charlie Simpson, Children, Haiti, Hope, Simplicity on February 8, 2010 by Sue. 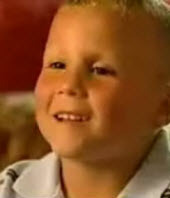 I found this uplifting story of seven year old Charlie. I remembered how Patreece was moved by another story of a 14 year old, Jake, below who had to jump in and help when he saw another in need. It also reminds of the message in our dear colleague, Judy Rogers’ book, Something Beyond Greatness, when there is a calling to act – you just can’t not do it. I’ve pasted in the story of Charlie from Wend. When seven year old Charlie Simpson saw the grim images of post-earthquake Haiti on television he reacted as most children his age would: he broke down and cried. But instead of begging his mother to change the station, the young bicycling aficionado asked how he could help. To date the West London youth’s philanthropic push–a five-mile sponsored bicycle ride around a local park–has raised $204,459.186 for UNICEF and inspired people throughout the world to lend a hand with disaster relief in Haiti. Charlie set out to raise £500 (around $800) for the Unicef Haiti Appeal by riding his bicycle 7 laps–about 5 miles–around a local park, asking for sponsors along the way. But some savvy adult (presumably his mother or father) set the young philanthropist up with an account at a website where donations can be collected online and once word about Charlie’s mission hit the internet, teary-eyed grown ups all over the world started opening up their pocketbooks. This entry was posted in Stories and tagged Children, UNICEF, Youth on February 2, 2010 by Robyn. “We saw him put his hand up and saying, ‘help, help,’ so we went over to him and pulled him on our board,” Satherley said on Monday. Jake Satherley and his partner in this extraordinary exploit, Spencer Jeams, rescued a middle aged man who was drowning in the ocean off the east coast of Australia. They are members of a lifeguard training program for under 14 year olds. This brief story was cited over 5,000,000 times in Yahoo and Google between 1/11/10 and 1/12/10 with almost the exact wording except for one report on abc.net that was different. There Mrs. Satherley reveals that the children had not been taught how to save people; that training would come in a couple of years. Jake’s mother added that her son has always been the type of child to save sick animals, birds, or lizards. This story is an inspiration about the innocence of children who, under the belief that they can, actually did – and jumped into a situation to save a life. Jake and Spencer used the training they received and took it to the next level instinctively. They responded without hesitation to their innate gift to be aware of a need and to act. Who would have thought that saving a lizard could translate into rescuing a person? May we as adults take the opportunity nurture that spark in every child that coul someday blossom into the fulfillment of a dream for them, for others and for ourselves. This entry was posted in Stories and tagged Australia, Children, Heroism, Lifesaving, Youth on January 31, 2010 by Sue. State Senate President Pro Tem, Rosa Franklin, who is a Democrat from Washington State, understands the power of negative labels. She wants 54 state law designations such as “at risk” and “disadvantaged” to be re framed to a new term, “at hope”. Senator Franklin believes that this could lead to a paradigm shift in State Government and in classrooms. This entry was posted in Stories, Words of Wisdom and tagged Education, Hope, State Government on January 29, 2010 by Sue. A fascinating article appeared in the New York Times on 10 January 2010, in which Brad Stone discusses current inter-generational gaps that are being influenced and increased by light-speed advances in technology. Entitled The Children of Cyberspace: Old Fogies by Their 20s, the article explores how the world view of children and young people is influenced by new technologies. It mentions how researchers theorize that “the ever-accelerating pace of technological change may be minting a series of mini-generation gaps, with each group of children uniquely influenced by the tech tools available in their formative stages of development“. It is certainly food for thought …. and yet another reminder for us all of how vitally important it is to create the space and time for meaningful inter-generational conversations! This entry was posted in Stories and tagged Children, Conversation, Intergenerational, Multi-generational on January 13, 2010 by Sue.